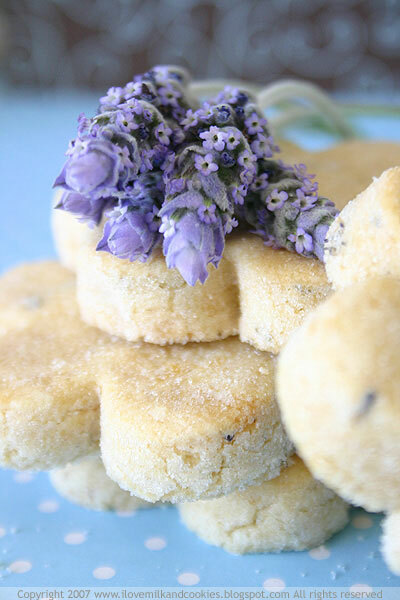 These rich but not too sweet shortbread cookies have just a hint of sweet lavender fragrance and flavor. in half. Flatten into squares and wrap in plastic. Chill until firm. On a floured board, roll or pat out each square to a thickness of 1/2 inch. Cut the dough into 1 1/2 -inch squares or rounds. Transfer to baking sheets, spacing cookies about 1 inch apart. Prick each cookie several times with a fork. Bake 20 to 25 minutes until pale golden (do not brown). Cool slightly, then transfer to a rack. Sprinkle with lavender powdered sugar. lavender powdered sugar: Put a 4 or 5 sprigs of lavender flowers in a sealed jar with powdered sugar for a day before using the sugar. Can you freeze the dough for later use or do you have to make them all at 1 time? Yes you can freeze the dough and keep it for up to 3 months. Hi Lora Yes you can freeze the dough and keep it for up to 3 months.